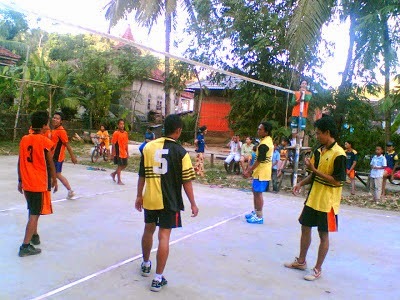 SUBSTITUTION PROCEDURE FOR VOLLEYBALL ~ Volleyball is a sport played by two teams on a playing court divided by a net. There are different versions available for specific circumstances in order to offer the versatility of the game to everyone. The object of the game is to send the ball over the net in order to ground it on the opponent’s court, and to prevent the same effort by the opponent. The team has three hits for returning the ball (in addition to the block contact). The ball is put in play with a service: hit by the server over the net to the opponents. The rally continues until the ball is grounded on the playing court, goes “out” or a team fails to return it properly. Substitution must be carried out within the substitution zone. A substitution shall only last the time needed for recording the substitution on the score sheet, and allowing entry and exit of the players. The actual request for substitution starts at the moment of the entrance of the substitute player(s) into the substitution zone, ready to play, during an interruption. The coach does not need to make a substitution hand signal except if the substitution is for injury or before the start of the set. If the player is not ready, the substitution is not granted and the team is sanctioned for a delay. The request for substitution is acknowledged and announced by the scorer or 2nd referee, by use of the buzzer or whistle respectively. The 2nd referee authorises the substitution. For FIVB, World and Official Competitions, numbered paddles are used to facilitate the substitution. be made in succession, one pair of players after another. If one is illegal, the legal one(s) is/are granted and the illegal is rejected and subject to a delay sanction.